Wedding Cake Topper 8"H, Weight 1 lb. Resin and Stone mix, rhinestones, fabric tulle veil. Literary caption: Love fulfills your heart and soul, love completes you. Language of Love designed by Gina Freehill is a complete wedding & anniversary accessory line. It has a timeless charm that will enhance your special day and your cherished memories for years to come. The 'Eternity' cake topper features the bride and groom placed in front of a beautiful pierced filigree heart that is enhanced with rhinestones. The brides gown with an open back design also showcases a beautiful rose pattern. The gown also features an engraved literary caption written by Gina "Love fulfills your heart and soul, love completes you." 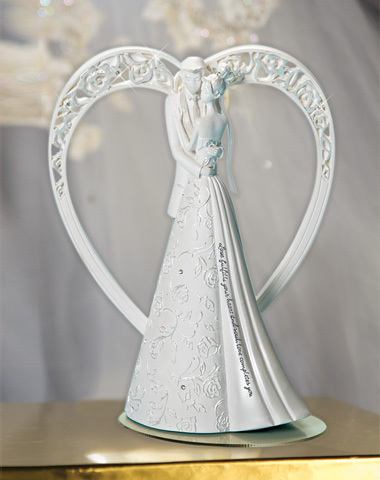 The 'Eternity' Wedding Cake Topper is also a stand-alone collectible and as an added value to customers, the collectible size 'Language of Love' Cake Toppers purchased here are hand signed by Gina Freehill. If you are looking for a topper that symbolizes true love the Eternity wedding cake topper is a beautiful choice to top your wedding cake!